I thought this was a great idea. 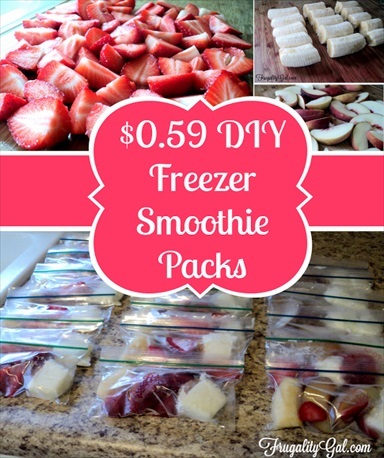 Jazmin of Frugality Gal prepares packets of sliced fruit and yogurt and then freezes them. The packets are in small freezer bags. When she wants to make a smoothie she’ll pulse some oats in a magic bullet or blender. The she’ll dump in one of the packets of fruit and yogurt along with some coconut milk. She also adds Splenda. You could also use Agave syrup. Jazmin provides step-by-step directions and excellent photographs. She explains how she freezes the sliced fruit, freezes smaller amounts of yogurt and then prepares the individual smoothie packs. She also shares how she avoids freezer burn. Nice article! Click on the Homemade Freezer Smoothie Packs link below to see the complete post.